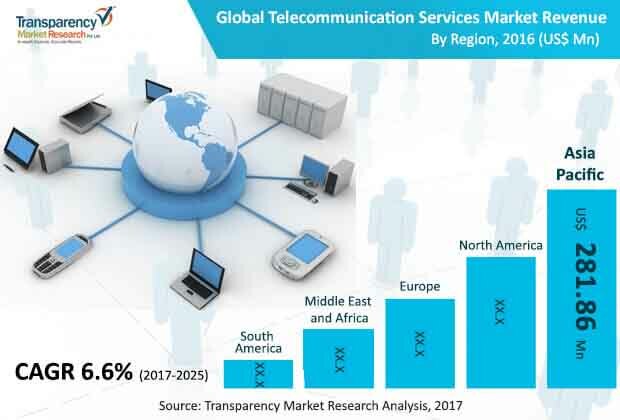 The global telecommunication services market has been projected by Transparency Market Research (TMR) to hold on to a significantly fragmented characteristic because of several industry players operating therein. A number of established players such as Vodafone Group PLC, Bharti Airtel, and AT&T Intellectual Property have showcased themselves as leaders of the market. The engagement of innovative and forward-thinking technologies could see a rise in the coming years as players constantly seek to improve their services in the market. There could be an increasing focus on extending geographical presence and adding new services for expanding the business in the industry with the help of strategic acquisitions and partnerships. As per a TMR report, a revenue generation of US$1.4 bn could be promised to be achieved by the global telecommunication services market in 2025. The market has been envisaged to expand at a 6.6% CAGR during the forecast tenure 2017-2025. In 2016, it had generated a revenue of US$0.8 bn. By type of package, the market could be commanded by triple play which accounted for a 38.4% share in 2016. By region, Asia Pacific has been foretold to be in the driver’s seat until the concluding forecast year while rising at a 6.9% CAGR. High industrial activity and the expansion of micro, small, and medium enterprises (MSMEs) across the globe have been envisioned to tellingly enhance the growth of the world telecommunication services market. MSMEs have been taking to the adoption of networking technology and IT solutions for enabling convergence across multiple devices, driving capex and opex efficiencies, and improving productivity. Mobile telecommunication services could be highly demanded in the market with the increasing adoption of smartphones offering a wide range of functions. Among the various types of mobile telecommunication services, internet and phone could hold a major prominence in the near future. Telecommunications is a faster growing industry that particularly interests the business world. Telecommunication services could be effectively used to strengthen business relationships and build a sound communication with customers. These services also allow an uncomplicated transmission of data and provide flexibility for the benefit of the employees of an organization. Security problems and equipment expenses have been prognosticated to decelerate the growth of the international telecommunication services market. Other factors which could hamper the demand for telecommunication services have been expected to be the expensive cost of value-added services and lack of awareness among consumers. However, the rising demand for high-speed internet and data processing, presence of e-education, e-agriculture, and other innovative services, and investment in wireless and satellite communication and other new telecommunication technologies could augment the demand in the international telecommunication services market. More opportunities have been envisioned to take shape in the market with the increasing penetration of internet of things (IoT) and advancement in technology. Telecom operators have been adopting IoT to reduce service delay times and dropped calls for refining customer service, improve coverage and bandwidth to reduce download times, and plan and monitor maintenance more efficiently.